My usual left-justified heading is all the way on the right just to emphasize that I'm out an a limb here. By vice of this web site, I'm regarded as a Prius guru among my friends and acquaintances. Why, just last week an inquiry poured in about some Prius feature and I dispatched it with panache and authority. In today's news, following several days of increasing hysteria about unintended acceleration in various Toyota vehicles, we were treated to a story about braking problems in the 2010 Toyota Prius. Toyotas apparently can't accelerate correctly or stop correctly. Soon we'll find out that even when they're standing still, they have a special component that somehow attracts meteors. Needless to say, when an issue affecting the lives and safety of millions of people arises, no matter how small the issue may be, hackles and cudgels* are raised. So, to save myself from responding to the thousands of millireaders who are sure to put me to the Question on this, I thought I'd elucidate the facts, at least as I am personally familiar with them. Q: What is the braking problem with the 2010 Prius? A: As I understand the news reports, when one is braking and goes over a bump, manhole cover, or other inhomogeneity in the road surface, there is a momentary (less than a second) interruption of braking action. Some drivers understandably interpret this as a short burst of acceleration, but it is not. Q: Do you have any idea why that happens? A: Yes. Normal braking in a Prius is a combination of electrodynamic braking and friction braking. Electrodynamic braking occurs when the vehicle speed is over 7 miles per hour and the driver commands relatively gentle braking. In electrodynamic braking, the electric drive motors work in reverse as generators to absorb the car's kinetic energy, convert it to electricity, and store it in the traction battery. This, in part, is why the Prius gets such good "city" mileage. Below 7 miles per hour, the car uses normal friction braking to slow down and stop. The Prius software and control design make the switchover essentially seamless. Quite a feat of engineering, in my opinion. Compare it to the mushy braking of the Ford Escape hybrid, for example. Although nobody from Toyota called to tell me this, I have to believe that the braking glitch has to do with momentary confusion in this system when the electrodynamic system gets an anomalous input while the friction system isn't engaged. Q: You're personally familiar with this? A: Yes. I could demonstrate it if necessary. During my commute there is a manhole cover a number of feet before a stop sign. I am inevitably braking gently when I'm by the manhole cover. If the road is wet and I deliberately drive over the slippery metal, I can feel the effect. Q: But wait! This problem is being reported for the 2010 Prius. I know you don't have one or you would surely have mentioned it. A: This "problem" has been present (and reported by other Prius owners) since the Generation II car came out in 2004. I've been noticing and ignoring it for over five years. Q: Then why is it just now making the news? A: There are a lot more Priuses on the road now, and so more people to report it. Eventually it reaches a statistical threshold. Also likely, a hue and cry was raised by the acceleration issue and the tendency to pile on is inescapable. Q: It sounds to me like it's a real problem. Why don't you think it matters? A: Unless this "new" problem is a different one from my experience, it only happens when there is little or no danger of an accident. The vehicle state under which it occurs is during modest braking, which is what you do when you have plenty of time to react. During a panic stop the friction brakes are activated immediately and the effect won't occur. Likewise, in the last few feet of your slowing down and stopping, the friction brakes are used exclusively. Unless you customarily race to stop signs and then brake heavily with no margin (which Prius drivers don't,) you will easily have an extra few feet to modulate your braking to stop at the intended location. Q: In other words, it's not a big deal, Prius owners shouldn't panic, and should take this in stride as they should the meteor-attractant. A: I'll issue a correction. Don't sue me. Before the iPad was introduced, speculation was that it would cost around a kilobuck. Apple stunned everyone with low end pricing of half that—$499 for the 16GB version. It only approaches the kilobuck when you get it from 16GB to 64GB of storage and add the 3G wireless capability. I have to assume that Apple believes that most of the customers will go for the high-end version. I think they won't. The 16GB version, at $499, looks like quite the bargain. Price increments for the additional storage are Apple at its unconscionable best. The iPhone and iPod are quintessentially portable devices, sometimes with no or slow wireless connections. For them it makes perfect sense to get as much memory as possible. In fact, the iPod Touch, a device which I personally love, will become mine as soon as it makes the leap to 128GB, which will be barely enough for my music. But the iPad? If it's going to sit in a cradle at home or otherwise be used where there's reliable Wi-Fi, why pay, in effect, $200 for 48GB of storage when network storage is essentially free? We'll find out soon enough if my speculation is correct. Look for a shortage of the cheap version and an abundance of the others. * First zeugma alert of the new decade. First asterisk of the new decade, for that matter! A Piece of computer history. 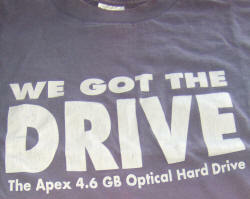 The Apex optical drive existed for a short period before the DVD standard ran roughshod over it. I still have a few media around if you happen to be using one and it isn't making funny noises yet. Any offers?